Five Fabulous 1930s Packards from the Richard A. Stephens San Francisco collection of some of the finest marques in the world feature in the Mecum Classic Car Auction at Las Vegas from 15th - 17th November. 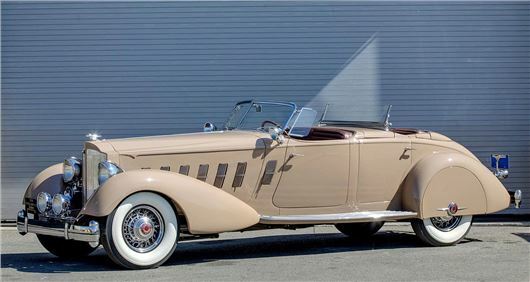 The 1934 Packard 1108 V-12 Sport Phaeton with Fran Roxas Coachwork in the style of LeBaron was designed by the great Alexis de Sakhnoffsky, one of the Russian expatriate’s grandest designs and hand-crafted by master coachbuilder Fran Roxas of Chicago. It features: 446/160 HP 67-degree L-head V-12 engine; Stromberg downdraft 2-barrel carburetor; 3-speed synchromesh manual gearbox; 4-wheel vacuum-assisted mechanical drum brakes; Dual remote spotlights; Pilot Ray lights; Wind wings; Chrome wire wheels and Wide Whitewall tires. It is estimated at $450,000 to $550,000. The 1934 Packard 1107 V-12 Club Sedan, is one of 960 V-12 Packards made that year. A CCCA Full Classic, it was the recipient of a comprehensive, sympathetic frame-off restoration and features: 445/160 HP V-12 engine; Stromberg dual downdraft carburetor; 3-speed manual transmission; Solid front axle with leaf springs; Semi-floating rear axle with leaf springs; 4-wheel vacuum-assisted Bendix drum brakes; Ride Control; Woodgrain dash and door sill accents; Swan hood mascot; Fender-mounted lamps; Dual horns; Waltham gauges; Dual side mounts with metal cases; Painted wire wheels;; Chrome trim rings and Packard script hubcaps and Wide Whitewall tires. It is estimated at $125,000 to $150,000. The 1939 Packard 1708 V-12 Brunn Touring Cabriolet is one of only two produced. A CCCA Full Classic, it qualifies as one of the rarest automobiles to carry the Packard nameplate. It features: 473 CI V-12 engine; Stromberg carburetor; 3-speed manual transmission; Independent front suspension; Rear leaf spring suspension; 4-wheel vacuum-assisted drum brakes; Wood dash and door sill accents; Roll down divider window; Passenger compartment clock; Dual side mounts with metal cases and accessory mirrors; Rear-mounted radio with armrest controls; Luggage rack; Swan mascot; Painted steel wheels; Chrome trim rings and Wide Whitewall tires. It is estimated at $150,000 to $200,000. The 1939 Packard 1708 V-12 7-Passenger Limousine is another CCA full Classic. It is a 17th Series 1939 Packard Twelve (Model 1708) 7-Passenger Limousine that represents one of the last examples of the famous Packard Twelve line. Previously part of the Browning Collection, this older restoration features a modified 473/175 HP V-12 engine; Stromberg carburetor; 3-speed manual gearbox; Independent front suspension; Rear leaf spring suspension; 4-wheel vacuum-assisted drum brakes; Black leather-trimmed driver's cabin; Beige cloth passenger compartment; Wood dash and door sill accents; Roll down divider window; Passenger compartment clock; Luggage rack; Trippe safety lamps; Amber fog lamps; Dual side mounts with metal cases and accessory mirrors; Swan mascot; Chrome hubcaps and trim rings and Wide Whitewall tires. It is estimated at $65,000 to $85,000.